Synsepalum dulcificum is a plant known for its berry that, when eaten, causes sour foods (such as lemons and limes) subsequently consumed to taste sweet. This effect is due to miraculin. Common names for this species and its berry include miracle fruit, miracle berry, miraculous berry, sweet berry, and in West Africa, where the species originates, agbayun, taami, asaa, and ledidi. Bumelia dulcifica uSchumach. & Thonn. Sideroxylon dulcificum (Schumach. & Thonn.) A.DC. The berry itself has a low sugar content and a mildly sweet tang. It contains a glycoprotein molecule, with some trailing carbohydrate chains, called miraculin. When the fleshy part of the fruit is eaten, this molecule binds to the tongue's taste buds, causing sour foods to taste sweet. At neutral pH, miraculin binds and blocks the receptors, but at low pH (resulting from ingestion of sour foods) miraculin binds proteins and becomes able to activate the sweet receptors, resulting in the perception of sweet taste. This effect lasts until the protein is washed away by saliva (up to about 30 minutes). The names miracle fruit and miracle berry are shared by Gymnema sylvestre and Thaumatococcus daniellii, which are two other species of plant used to alter the perceived sweetness of foods. The berry has been used in West Africa since at least the 18th century, when European explorer the Chevalier des Marchais provided an account of its use there. Marchais, who was searching West Africa for many different fruits in a 1725 excursion, noticed that local people picked the berry from shrubs and chewed it before meals. In the 1970s in the USA, an attempt was made to commercialize the fruit for its ability to turn unsweet foods into sweet foods without a caloric penalty, but ended in failure when the U.S. Food and Drug Administration (FDA) classified the berry as a food additive. There were controversial circumstances with accusations that the project was sabotaged and the research files stolen by the sugar industry to prevent loss of business caused by a drop in demand for sugar. However, the FDA has denied receiving any pressure from the sugar industry. Arguments similar to the ones used for this classification were used for the FDA's regulation on stevia now labeled as a "dietary supplement" instead of a "sweetener". For a time in the 1970s, US dieters could purchase a pill form of miraculin. This phenomenon has enjoyed some revival in food-tasting events, referred to as "flavor-tripping parties" by some. The tasters consume sour and bitter foods, such as lemons, radishes, pickles, hot sauce, and beer, to experience the taste changes. It is a shrub that grows between 1.8–4.5 metres (5.9–14.8 ft) in height and has dense foliage. Its leaves are 5–10 centimetres (2.0–3.9 in) long, 2–3.7 centimetres (0.79–1.46 in) wide and glabrous below. They are clustered at the ends of the branchlets. The flowers are white. It carries red, 2-centimetre (0.79 in) long fruits. Each fruit contains one seed. The plant grows best in soils with a pH as low as 4.5 to 5.8, in an environment free from frost and in partial shade with high humidity. It is tolerant of drought, full sunshine and slopes. The seeds need 14 to 21 days to germinate. A spacing of 4 m between plants is suggested. The plants first bear fruit after growing for approximately 3–4 years, and produce two crops per year, after the end of the rainy season. This evergreen plant produces small, red berries, while white flowers are produced for many months of the year. The seeds are about the size of coffee beans. In Africa, leaves are attacked by lepidopterous larvae, and fruits are infested with larvae of fruit-flies. The fungus Rigidoporus microporus has been found on this plant. Transgenic tomato plants have been developed in research projects that produce miraculin. In tropical West Africa, where this species originates, the fruit pulp is used to sweeten palm wine. Historically, it was also used to improve the flavor of soured cornbread, but has been used as a sweetener and flavoring agent for diverse beverages and foods, such as beer, cocktails, vinegar, and pickles. The berry is on the EU list of Novel Foods, and requires a safety assessment before it can be sold as food or used as a food additive. Since 2011, the United States Food and Drug Administration has imposed a ban on importing Synsepalum dulcificum (specifying 'miraculin') from its origin in Taiwan, declaring it as an "illegal undeclared sweetener". ^ "Synsepalum dulcificum (Schumach. & Thonn.) Daniell". Plants of the World Online. Royal Botanic Gardens Kew. Retrieved 2019-03-06. ^ a b c Wiersema, John Harry; León, Blanca (1999). World Economic Plants: A Standard Reference. CRC Press. p. 661. ISBN 0-8493-2119-0. ^ Peter Hanelt, ed. (2001). Mansfeld's encyclopedia of agricultural and horticultural crops. 2. Springer. p. 1660. ISBN 3-540-41017-1. Archived from the original on 2016-06-04. ^ a b c d e f James A. Duke, Judith L. DuCellier, ed. (1993). CRC handbook of alternative cash crops. CRC Press. pp. 433–434. ISBN 0-8493-3620-1. ^ John C. Roecklein, PingSun Leung, ed. (1987). A Profile of economic plants. Transaction Publishers. p. 412. ISBN 0-88738-167-7. ^ a b Plant inventory. 58: Seeds and plants imported. United States Department of Agriculture. 1919. p. 42. ^ a b Levin, Rachel B. (June 23, 2009). 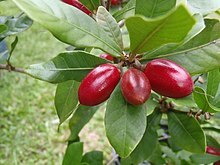 "Ancient Berry, Modern Miracle: The Sweet Benefits of Miracle Fruit". thefoodpaper.com. Archived from the original on August 10, 2009. Retrieved 2009-08-20. ^ McCurry, Justin (2005-11-25). "Miracle berry lets Japanese dieters get sweet from sour". London: The Guardian. Archived from the original on 2013-08-29. Retrieved 2008-05-28. The berries contain miraculin, a rogue glycoprotein that tricks the tongue's taste-bud receptors into believing a sour food is actually sweet. People in parts of west Africa have been using the berries to sweeten sour food and drink for centuries, but it is only recently that the global food industry has cottoned on. ^ Koizumi A, Tsuchiya A, Nakajima K, Ito K, Terada T, Shimizu-Ibuka A, Briand L, Asakura T, Misaka T, Abe K (2011). "Human sweet taste receptor mediates acid-induced sweetness of miraculin". Proc. Natl. Acad. Sci. U.S.A. 108 (40): 16819–24. doi:10.1073/pnas.1016644108. PMC 3189030. PMID 21949380. ^ Park, Madison (March 25, 2009). "Miracle fruit turns sour things sweet". CNN. Archived from the original on March 27, 2009. Retrieved 2009-03-25. ^ Mangold, Tom (2008-04-28). "Sweet and sour tale of the miracle berry". The Week. Archived from the original on 2011-11-16. Retrieved 2011-10-31. ^ "The miracle berry". BBC. 2008-04-28. Archived from the original on 2008-05-01. Retrieved 2008-05-28. I honestly believe that we were done in by some industrial interest that did not want to see us survive because we were a threat. Somebody influenced somebody in the FDA to cause the regulatory action that was taken against us. ^ Rowe, Aaron (2006-12-07). "Super Lettuce Turns Sour Sweet". Wired Magazine. Archived from the original on 2008-08-31. Retrieved 2008-07-22. ^ Farrell, Patrick; Kassie Bracken (2008-05-28). "A Tiny Fruit That Tricks the Tongue". The New York Time. Archived from the original on 2008-06-12. Retrieved 2008-05-28. ^ Inglett, G. E.; Dowling, B.; Albrecht, J. J.; Hoglan, F. A. (1965). "Taste Modifiers, Taste-Modifying Properties of Miracle Fruit (Synsepalum Dulcificum)". Journal of Agricultural and Food Chemistry. 13 (3): 284–287. doi:10.1021/jf60139a026. ^ Inglett, G. E.; May, J. F. (1968). "Tropical plants with unusual taste properties". Economic Botany. 22 (4): 326–331. doi:10.1007/BF02908127. ^ Hirai, Tadayoshi; Go Fukukawa; Hideo Kakuta; Naoya Fukuda; Hiroshi Ezura (2010). "Production of Recombinant Miraculin Using Transgenic Tomatoes in a Closed Cultivation System". Journal of Agricultural and Food Chemistry. 58 (10): 6096–6101. doi:10.1021/jf100414v. ISSN 0021-8561. PMID 20426470. ^ Sun, Hyeon-Jin; Hiroshi Kataoka; Megumu Yano; Hiroshi Ezura (2007). "Genetically stable expression of functional miraculin, a new type of alternative sweetener, in transgenic tomato plants". Plant Biotechnology Journal. 5 (6): 768–777. doi:10.1111/j.1467-7652.2007.00283.x. ISSN 1467-7644. ^ Oliver-Bever, Bep (1986). Medicinal plants in tropical West Africa. Cambridge University Press. p. 266. ISBN 0-521-26815-X. ^ "Novel Food catalogue - Search (Synsepalum dulcificum)". European Commission. Retrieved 2015-08-16. ^ "Synsepalum dulcificum Import Alert 45-07; Taiwan". US Food and Drug Administration. 5 February 2018. Retrieved 9 February 2018. Wikimedia Commons has media related to Synsepalum dulcificum.